This month will just be a few reminders for State Session. We will again be hosting the Hospitality Room at the Session and would appreciate any and all donations of snacks - crackers, cookies (homemade are the best), cheese, chips, pretzels, dips, etc. 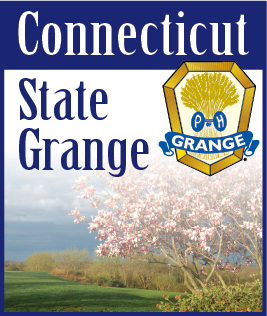 Then we have the request from National Grange for ornaments to be put on the CT tree at the National Session and then they will be donated to various charities. Last, but not least, we are looking for the quilt squares which will again be sent to national for judging and the winners included in the quilt to honor the 150th Anniversary of the National Grange. The prize winning entries in the NE Needlework contest will be on display in the Hospitality Room and prize money will be awarded at the luncheon on Friday.